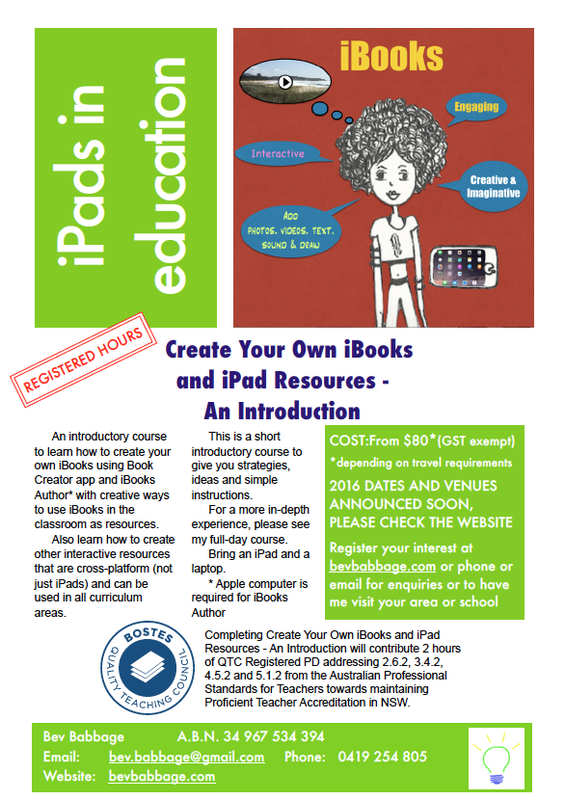 A 2 hour introductory course to learn how to create your own iBooks using the Book Creator app and iBooks Author* with creative ways to use iBooks in the classroom as resources. This is a short introductory course to give you strategies, ideas and simple instructions. For a more in-depth experience, please see my full-day course here. Completing Create Your Own iBooks and iPad Resources – An Introduction will contribute 2 hours of QTC Registered PD addressing 2.6.2, 3.4.2, 4.5.2 and 5.1.2 from the Australian Professional Standards for Teachers towards maintaining Proficient Teacher Accreditation in NSW. From $80 per person (GST exempt), depending on travel required.. If your school prefers to pay be cheque, I can send an invoice.